Looking at the noun discipline and the verb discipline, some critical differences become apparent. As a noun, discipline is usually understood as behavior and order in accord with rules and regulations, or behavior maintained by training as in “discipline in the classroom.” You seldom hear any controversy about the noun discipline. Everybody seems to be in favor of that kind. The word conjures up order, organization, cooperation, knowing and following rules and procedures, and a consideration for the rights of others. Understanding the difference between the noun and the verb forms of discipline is of utmost importance for yet another reason: it clarifies that the discipline controversy is really about how we should deal with kids (the means) and not about what we want them to do (the ends.) Most people would agree that we want kids to be orderly, cooperative, and considerate, but there are intense differences about whether disciplining (the verb) is the best means to bring about discipline (the noun,) a generally agreed-upon end. In discussions of discipline, it is quite often assumed that the only way to get discipline (the noun), both at home and in the classroom, is for parents to discipline (the verb) – that is, control, punish, penalize, correct, and chastise children. P.E.T. is based on considerable evidence refuting this widely-held belief. 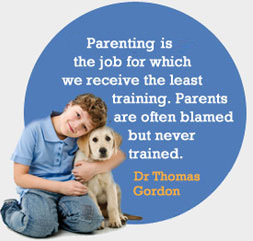 Dr. Thomas Gordon’s three nominations for the Nobel Peace Prize were a result of this work which is guiding parents to the discovery that disciplining children may be the least effective way to get discipline at home.